Engineer Suite is a set of Windows programs (comprising NPC Engineer and Spell Engineer at this time) designed to facilitate the process of getting information into Fantasy Grounds. I have finally got the bug again. I am enjoying programming now. There were quite a few months there where I felt I'd hit a wall. The whole process seemed like work and every task seemed to be huge. Worse, the longer I spent away from the keyboard the less I understood my own code. It was a bit of a vicious circle and I was worried I'd have to pass the project on to someone else. Thankfully, though, I found a way back in. The people on the Discord channel had asked for a couple of things and this proved to be the impetus I needed. I've made a raft of small improvements and added a couple of what feel to be significant features. I've also had a change of direction re: what is happening next; Table Engineer seems to be what I want to do. I'm also excited to push on with the XML validation task. A change is as good as a rest, they say, and I am sure I will come roaring back at Equipment Engineer in the near future. Cheers to one and all for support and feedback. Back on track with some updates! It took me a while to get over my setback, but eventually I crawled back to the keyboard. I found the issue and managed to correct it, and got the bug back again. 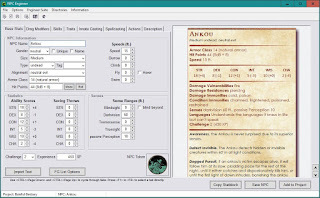 The most recent update has a couple of requested features - an improved Languages section, and the ability to deal with Psionic spellcasters. There's a load of other tweaks too. I've added a few more videos over at the Patreon site too for subscribers there. If you've donated to me in any way in the past, you can have access to these videos too - just PM me in Discord and I'll give you the user rights. Thanks as ever for the support, folks! I've rolled back to version 0.4.41 as I found a bug I couldn't correct in some of my recent updates. It's taken me a week to roll back because I also discovered an issue in Github Desktop - it didn't allow for rolling back! I found out something about myself. I don't deal all that well with setbacks :) Growth mindset though. Doing the updates a second time will allow me to improve them, right? I'm back to a position I can try to move forward from again. I apologise deeply if you had issues with recent FG modules and they were caused by my bug. Try compiling them again with this version and everything should be safe. As ever, any issues you find - don't hesitate; give me grief on Discord! After yesterday's post I felt it was necessary to get my arse in gear and do some work. A couple of minor niggles had been pointed out in the past 5 weeks or so, and so I got down to fixing them. Let me tell you this: the first half hour or so felt like I was wearing someone else's shoes or something. I had little clue what I was doing! It is amazing how quickly you de-skill if you don't work at something... Eventually, though, I got myself together and remembered both the structure of the app and how to write some code. I fixed four or five issues, and it felt GREAT! I have uploaded the fruits of today's work. Next goal: more work on Equipment Engineer. Watch this space...! Wow.... the Christmas rush, then the holiday period, then the post-holiday depression. 2 months have passed with no updates at all! I've been hard at work trying to get caught up. I have added some videos to the Patreon site (https://www.patreon.com/engineersuite) and I updated the 1d6 Adventurer Compendium. I went through it all and standardised some of the presentation. It was a mammoth task, but it is done! With those out of the way, it is about time I started programming again. That's where all of this started, after all! I have started work on Equipment Engineer, and over the course of this week I have nailed down the GUI. This was always the biggest challenge of EE for me, as I couldn't quite see an easy way to do it. A tab for each type of item might have worked, but it would have been annoying. Cramming everything onto one page would be better, but confusing as not all items require all fields. I settled on disabling all fields that don't pertain to the selected item type. This seems to work well, and early feedback seems to approve. I also moved descriptive text, No-ID text and item image to a second tab, freeing up plenty of space to work with. A couple of decent discussions on Discord and the FG Forums helped distill my ideas, and threw up a couple of items that I knew nothing about. You'll now be able to set the crit range and the reroll trigger for a weapon. I also found out you can add more than one damage roll per weapon, and have multiple damage types. All of these new ideas show the benefit a 'hive mind' brings to a project, and it makes me grateful that there's a community building around Engineer Suite. There are a couple of features I inend to build in that have got me excited. Firstly, weapons. NPC Engineer has a weapons table (for use by NPCs) and it makes sense to allow linking of these two areas. It'll take a bit of tweaking but I'll get there. The other one is the ability to build a pack with items in it that can be dragged to a character's inventory. This isn't something you can do from within FG, so I am keen to get this enabled. As it will require a lot of data input to allow for a list to select from, this will be put off until the base load/save/parse functions are enabled. So it seems I have some sort of creativity back, and I am enjoying my programming again. I have a roadmap. I feel all set to work EE through to completion in as short a time as possible. Don't forget to check out the Patreon site for 'work in progress' videos that are freely available to everyone (and also the series of tutorial videos for Engineer Suite that are available to Patrons). 1d6A Compendium gets a massive update! After a summer/autumn of avoidance, of programming and of video making, I finally forced myself to get back to adding monsters from the 1d6 Adventurers guys. Well, I found out that they don't slack off! 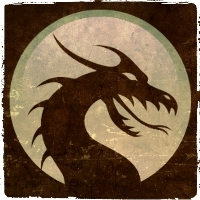 I added just over 80 monsters over the last couple of days, and that really focuses your NPC building technique. So just in case you are new to Engineer Suite, here's what I think to be the best way of working. Note that preparation is half the battle! I downloaded the pdf for each NPC from the id6A Reddit site, loaded them all into PDFmate and left it for a minute or so to extract all the images from all the files. Next I named each image. This is tedious, but saves a tonne of time in the long run. Copy folder name, paste onto image name. Repeat nearly 100 times. Move all the images into a dedicated folder. 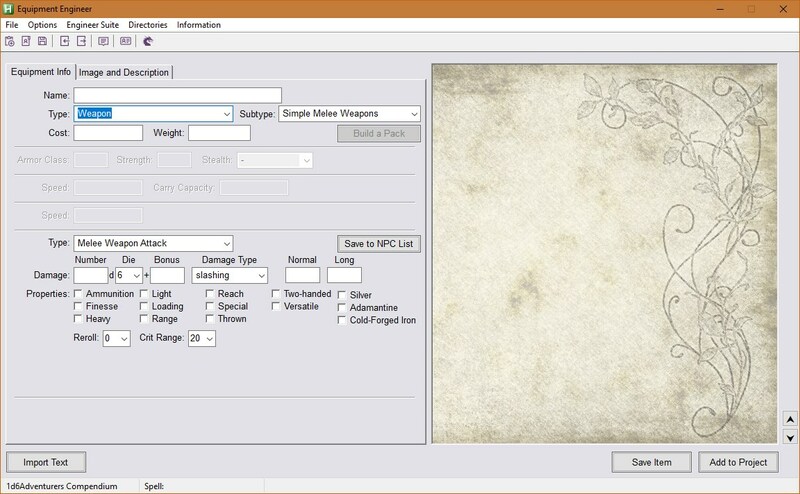 Use TokenStamp2 to create a token for each NPC. Move all of these to the same dedicated folder. Load each image into an image editor, resize it, apply a background, apply a border, save. 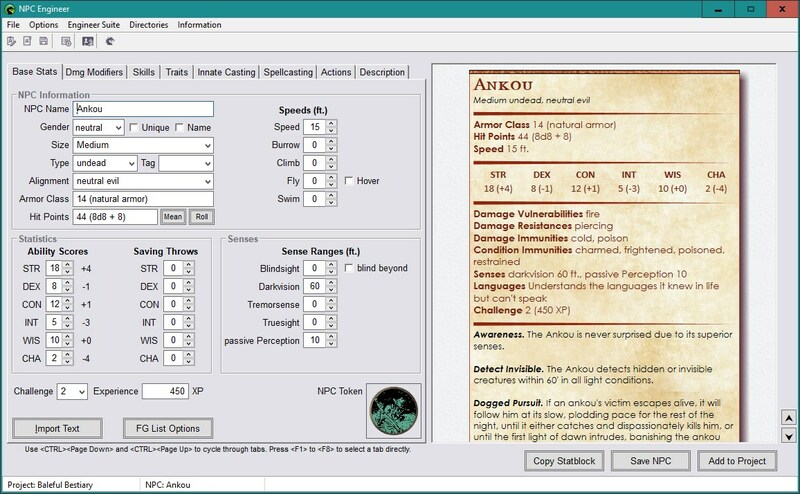 Use 'Import' in NPC Engineer and copy the text from the PDF or webpage for each NPC. I find the web page easier. Add the image. Copy-paste the attribution information (artist name and website). This is tedious but necessary if anyone else other than you is going to see it! Add the description last of all. Check that spells imported correctly. Save and Add to Project. I have launched a Patreon site. I don't expect to get rich from it - that isn't the goal of launching it. I am using it to keep myself motivated for an aspect of Engineer Suite that doesn't excite me - making video tutorials. There have been a few requests for these, though, and as Engineer Suite gets more complex they will become necessary. So far I have just uploaded a single video (about the various program wide settings), and this was more to test out the video recording software, the video editing software, the animated intro, and my own ability to speak without stumbling over every second word! All of that (except the last) went well, so I'll give it a go. I reckon I have thrown between 10 and 15 hours at this so far, so I only need about 100 subscribers to reach minimum wage! There are a lot of areas to work through, and I intend keeping the videos small and manageable. I don't have the Youtuber 'talent' to pad out 90 seconds useful content to a 30 minute video, so that'll help! If you can see any way to improve this offering, please let me know. I am uncomfortably aware that some people have already been very generous with their donations, and I can't find a way to make Patreon let these people in for nothing. I am keen that no-one should be paying me via both avenues, so if you have 'bought me a coffee' already you can send me a note of your name and email address (PM on Fantasy Grounds forum, email, Discord PM, any other way you wish) and I will email links to private versions of the videos as and when they become available. The Patreon site is https://www.patreon.com/engineersuite - I hope to see a few of you there! More tidying up, and still nothing on Equipment Engineer. I have uploaded a small update. Mainly it adds things to Spell Engineer to advance it towards perfection(! ), but a global option to change how long the tooltips stay visible was added. It was good to work on these items, as I am drying up again. I have been trying to add a filter to NPC Engineer for Roll20, and I have been stymied at all angles. The frustration of this is eating at me; I might have another go yet, if I can find another avenue. Browser extensions might be my last option. I also have 'white page syndrome' for Equipment Engineer. I think I need to talk it out with someone on Discord just to get my head in order. Once I have a clear picture of how I want the GUI to look, I'll knuckle down and right the bloody thing. Feel free to harass me on Discord about it, particularly if you have ideas! I don't even have much to say here just now either.... I have writer's block! I know, it has been a while since I posted anything here. Shut up. I've been busy, honest! 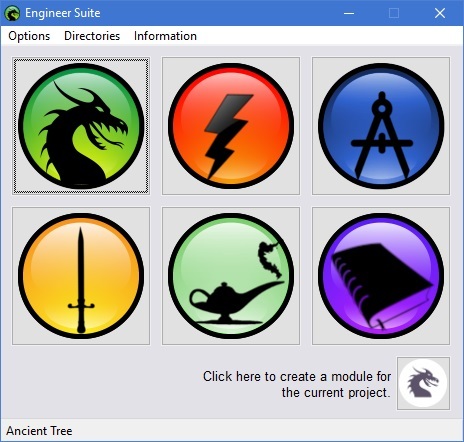 Mainly I have been tidying up small bugs in NPC Engineer and Spell Engineer, readying Equipment Engineer's framework, and tying all the modules together into one unifying program called Engineer Suite. You should be able to jump between modules if you wish (although you'd be better to close one module and open the next from the main window). This has advantages going forward. Much as I liked the idea of a whole suite of individual programs, the integration and shared code seemed like a better idea. It makes it easier for people to update too. There should be no changes that affect your data, but you'll note that the version number indicates a beta again. You'd be advised to keep a backup of your data for now in case of crashes. I don't expect any, but then I never do! Please feel free to get in touch about any issues. I hope there are none! Full installer. This is the recommended method. Engineer Suite.zip - All files necessary to run NPC Engineer. Export to a variety of formats, including RTF for MS Word, BBCode and HTML. It is also possible to create NPCs from scratch, save them individually to an NPC file for later parsing, and export to a NPC file suitable for other parsers. Images and tokens are handled as smoothly as possible - both are copied to the correct directory and renamed properly to make the process of building a bestiary as quick and as accurate as possible. The module file produced has a library section which mimics the Monster Manual, and NPCs import spell information and spell slots automatically when opened or added to the combat tracker (assuming you have the source book required open). 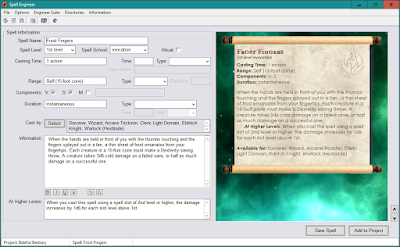 All NPC functions are fully supported - Actions, Legendary Actions, Lair Actions, Spellcasting and so on. 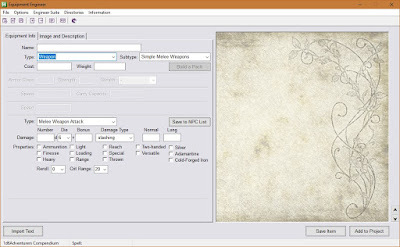 This version also creates a reference manual section for NPCs fully automatically. It is also possible to create spells from scratch, and save them individually to a Spell file for later parsing. The module file produced has a library section which mimics the Player's Handbook. The Engineer Suite exists to make the process of entering D&D 5E information into the Fantasy Grounds VTT as simple as possible. From copy-pasting from websites and PDF documents to publishing a final module, every aspect of asset creation is covered. If you appreciate my work you can buy me a coffee. Thank you! Background image is Milur by TyphonArt. It can be found on his DeviantArt site.